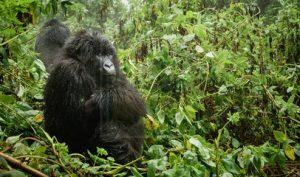 The 2 Days Rwanda Gorilla Safari is one of the best short gorilla trips in Rwanda for the limited time travellers. It is a bit relaxed compared to one day encounter and it is affordable because of its few days. The safari tour commences and ends in Kigali Rwanda offering you an opportunity to explore the rural landscapes of Rwanda with their hilly landscape that have earned it a dub as the land of a thousand hills. Having moments with the critically endangered mountain gorillas that are known worldwide to be thriving in the Virunga Massif and in the neighboring Uganda’s Bwindi Impenetrable National Park generate a remarkable memory of a life time. You wake up early in the morning at your lodge for breakfast and embark on the transfer to Volcanoes National Park Park headquarters Kinigi. At the headquarters as you wait for the briefing time, you are treated for a warm cup of coffee served courtesy of Rwanda Development Board while being entertained by the Kinyarwanda dance troupes before the park rangers set to allocate the respective gorilla families and then briefing in your respective gorilla groups at 8am. After briefing you drive to the respective gorilla family trail heads to head to the jungle in search of the critically endangered apes. The hike through the volcanic slopes marked with steep slopes and dense vegetation beautiful in nature present amazing scenic views. The eventual encounter with the mountain gorillas as they forage to feed their huge tummies, attending to the frightening welcome of the silverback, watching the baby gorillas as they roll themselves on tree branches, play with other and respective mothers among other aspects will lure you into an unforgettable amazement. The one hour is availed to you to experience what you have heard, read and thought of for long and the remarkable pictures will form a lasting memorabilia for this lifetime experience that is so far the best in Africa. The gorilla trekking activity tends to last 2 – 8 hours depending on how long the gorillas have moved. You retreat from the activity and embark on the drive back to Kigali.